Fourth Row Center: Film Writings by Jason Bailey: #TribecaFest Review: "Grave Encounters"
The Vicious Brothers’ Grave Encounters is a modestly clever riff on a film we’ve seen many, many times before. 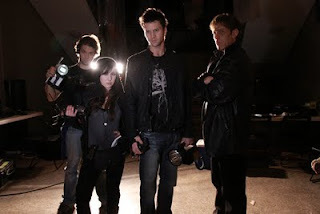 The first scene, an interview with a TV producer, explains the premise: several years ago, he was pitched a reality show, in which Lance Preston (Sean Rogerson) and his crew would seek out paranormal activity and shoot their attempts to contact the spirit world. The first five episodes, we’re told, went fine, “and then,” he says ominously, “they got to episode six.” And with that, he introduces footage from their “eight-hour lockdown” in Collingwood Psychiatric Hospital. Yes, folks, we’re back in the “found footage horror movie” realm, the land of The Blair Witch Project, Cloverfield, Paranormal Activity, and The Last Exorcism. But the opening sequences have enough of a sly sense of humor that our hopes are lifted, just a little; they get the “unaired promo” for the show just right (the cheeseball graphics and eerie music are straight off the SyFy channel), the creepy black-and-white archival footage feels authentic, and Rogerson has the host’s jive delivery down cold. The exposition is also efficient: an expert comes in (for the show, but for us) to fill in the building’s backstory, and we get our physical bearings via a guided tour from the building’s caretaker, who couldn’t be less comfortable on camera (which provides a nice little shot of comedy). Once all that set-up is dispensed with, the picture gets down to what we’ve come to expect: night-vision photography, shaky handheld camerawork, and screeching, expletive-filled acting. At first, the night is uneventful; an irritated Lance announces, “this place is about as haunted as a sock drawer.” But then Matt (Juan Riedinger), the A/V guru, goes to gather up the cameras, and actually says, “I’ll be right back.” D’oh! He’s not right back, of course, so they wander the halls looking for him briefly (the dialogue is basically five minutes of “Matt!” and “MAAAAATTTT!!!”). Then they get sidetracked by trying to get out of the building, and the poor guy’s unmentioned for a good chunk of the film. What happens next, however, is fairly ingenious: the building turns into an endless series of trick exits, in which each door is broken down to reveal another hallway. Time weirdly stops—not only does the caretaker’s return time pass, but suddenly it’s one in the afternoon and it’s still dark outside. This stuff is clever. What it is not, though, is all that scary. They finally start to get some tension going in the third act, and even work in a good jump or two (and a couple of gross-outs as well). The sound design is creepy, and the digital “hits” are an effective tool. But the picture never really goes to work on us, not the way the best of its predecessors did, and the many unfortunate echoes of those films don’t help (Lance’s tearful talking to camera can’t help but recall Blair Witch). It all gets pretty monotonous before too long; “We spent all day walking in one direction,” Lance says, “and we didn’t get anywhere.” Yeah, no kidding. In the final scenes, there is the suggestion of a morality tale within Grave Encounters—the charlatan who gets a taste of real fear. Alas, that’s merely a hint; then it’s on to the last scene, which plays like a bad joke. It’s too bad. In those early scenes, Grave Encounters had promise. It almost seemed like they were doing a wry satire of an overdone genre, when they were really just revving up for a trip down the same damn road. "Grave Encounters" is showing at the Tribeca Film Festival. Its final screening is today.